When we have a headache or experience any kind of body ache, we open our medicine cabinets and reach for a bottle of aspirin. This pain reliever and heart attack preventer is a “miracle drug” that has been one of the most popular pharmaceutical agents for over a century, but its natural equivalent has been used for thousands of years. Willow bark, also known as “nature’s aspirin,” contains a precursor to aspirin, which essentially provides the same benefits as the tablet. Willow bark, specifically white willow bark, is available in the form of actual bits of tree bark for chewing, powder, and liquid extract. The usual dose of white willow bark, says the University of Maryland Medical Center, is 240 milligrams (mg) a day. Now, although willow bark provides similar benefits like aspirin, too much willow bark can cause its own set of problems. In moderation and consumed responsibly, willow bark can be an excellent natural alternative to aspirin, eliminating the side effects of the tablet. So, get chomping at the bit! Willow bark extract can be found as an ingredient in cosmetics and personal care products due to its astringent, anti-inflammatory, and soothing properties. It contains salicylic acid, a BHA that is a natural exfoliant used in several acne treatments because it can help skin shed dead cells while clearing pores. It also contains phenolic acids, including salicin, salicortin and flavonoids, tannins, and minerals, which help with skin rejuvenation. A study published in the journal Clinical Therapeutics found mild or moderate acne can be treated with nonprescription agents such as salicylic acid. This agent can reduce the number of primary lesions and therefore, the severity of all acne-related lesions. Salicylic acid has been shown to be more superior to benzoyl peroxide in reducing acne. Salicin in willow bark is believed to turn into salicylic acid when it's processed by the body. 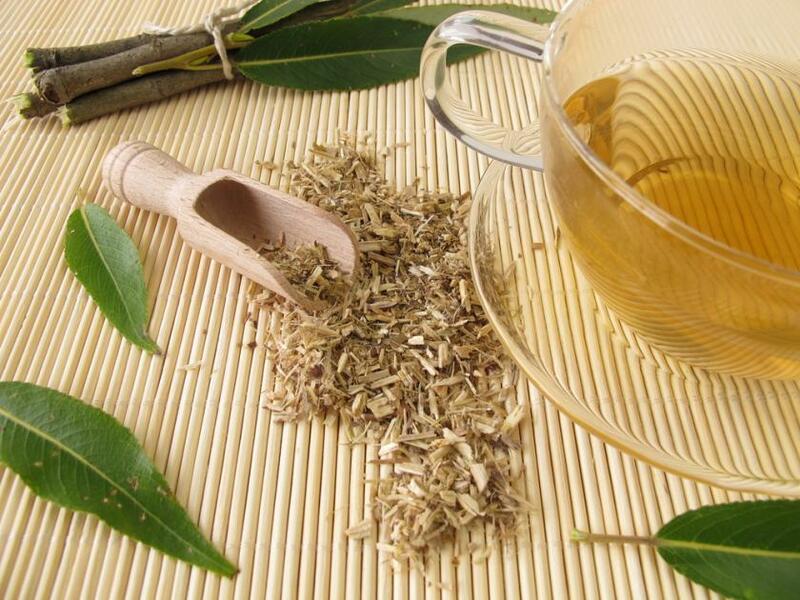 The consumption of white willow bark may help reduce the tension from headache-related pain. It contains the chemical salicin similar to acetylsalicylic acid in aspirin. The University of Maryland Medical Center states feeling the effects of willow bark may take longer to experience, but the effects can last longer compared to aspirin. Willow bark supplements could be a natural remedy for lower back pain, neck, and muscle aches. Brennecke believes its fine to take white willow bark to help relieve some of that pain. “The components of white willow bark inhibit cyclooxygenase, which is responsible for the formation of prostaglandins, which is an inflammatory mediator. By stopping the formation of prostaglandins, white willow bark acts as an anti-inflammatory agent,” he said. A 2001 study published in the journal Rheumatology found in a group of nearly 200 people with low back pain, those who received willow bark showed a significant improvement in pain compared to those who received a placebo. Moreover, those who received higher doses of the herb, specifically 240 mg salicin, experienced more significant pain relief than those who received a low dose of 120 mg salicin. Willow bark can be an effective treatment for reducing arthritis and osteoarthritis-related pain by decreasing the swelling. By inhibiting cyclooxygenase and therefore, prostaglandins, according to Brennecke, it will reduce inflammation, thereby lessening the crippling pain. It's suspected white willow bark extract may regularly suppress the progression and onset of the disease. A 2004 study published in the Journal of Rheumatology found people with osteoarthritis who took willow bark extract providing 240mg of salicin reduced their pain by 14 percent compared to two percent in the placebo in a two-week randomized controlled trial. “White Willow bark contains salicylates,” which means it has the same effect on the heart as aspirin does, according to Brennecke. Although drinking white willow bark tea can thin the blood like aspirin — making it less likely to clot — it’s important to know how much salicylates you get in each cup and monitor that amount. Typically, menstrual cramps are usually the result of inflammation of the uterine lining and the contractions triggered by prostaglandins. Willow bark is believed to regulate the production of prostaglandins and reduce inflammation, which helps soothes not only cramps but PMS symptoms. According to the University of Maryland Medical Center, professional herbalists recommend willow bark for menstrual cramps although there are no scientific studies to show it works. Brennecke disagreed and stated, “Ibuprofen is a better choice when it comes to PMS and menstrual cramps.” However, “It would be fine to drink white willow bark tea while PMS and menstrual cramps are occurring, but if taken while menstruating, [it] could increase the bleeding.” He advised pain killers are a better option because it doesn’t thin the blood nearly as much as salicylic acid does. Willow bark is considered to be a safer and natural alternative for those who can’t stomach the side effects of aspirin.